Our operating payroll and benefits cost as a percentage of sales was 23.8% or 110 basis points worse year-over-year due to higher incentive compensation expense, the unfavorable impact of nearly 5% wage inflation and incremental investment in labor related to virtual reality, higher medical insurance claims compared to last year and the impact of noncomp stores. G&A expenses were $16.1 million, up from $14.4 million in the prior year, reflecting higher bonus expense, increased headcount to support a growing store base, greater medical insurance claims and higher IP and legal expenses, partially offset by lower share-based compensation expense. As a percentage of revenues, G&A expenses were 10 basis points unfavorable versus the prior year. EBITDA was $72.1 million, up 1.9% and EBITDA margins were 21.7% down 150 basis points versus the prior year. On a comparable week basis, EBITDA was up 5.6% year-over-year and EBITDA margins were down 210 basis points. Adjusted EBITDA of $80.2 million was down 2.8% but on a comparable week basis was up 1.2%. Net interest expense for the quarter increased to $3.7 million, up from $2.6 million in the prior year, driven by increases in the underlying LIBOR rate and higher average debt levels resulting from our capital allocation initiatives, including share repurchases and the quarterly cash dividends. Dave & Buster's Q4 earnings were positive, is there a runway? Growing international macroeconomic conditions and weaker global trade growth trends continue. Asia volume weakness, which we experienced during peak season, deepened post-Chinese New Year. Reflecting these macro challenges, FedEx Express International revenues declined year-over-year in the third quarter. U.S. volume growth continued to benefit from the expansion of our e-commerce solutions. Yields were pressured by this expansion, lower weight per shipment and service mix changes. With that, total FedEx Express revenue declined 1% year-over-year in Q3 versus growth of 8% year-over-year in the first half of this fiscal year. Our Strategic Management Committee has been investing a significant amount of time identifying operational and financial steps to address the challenges we are facing. To mitigate the lower-than-expected revenue trends, we have further reduced our variable incentive compensation, launched our voluntary employee buyout program and limited hiring and discretionary spending. FedEx Ground and FedEx Freight both had strong volume and revenue growth in the third quarter. FedEx Freight continued to focus on balanced volume and yield growth and produced another strong quarter of operating results. FedEx Ground operating results were negatively impacted by the inflationary impact, the tight labor market on our purchase transportation rates and employee wages. Higher costs related to staffing and network expansion in the January launch of year-round 6 day per week operations also impacted Ground's performance. What's at the root of FedEx's Q3? I'll take that one, Karen. Well, obviously, a lot of -- we made a lot of investments in 2018, which affects a wide variety of different lines. And it's difficult to say, obviously fuel had a good quarter or -- and a good year. When you look at trying to back into the core, what do you do with digital, which has been a headwind, and we continue to invest in digital. If you don't back that headwind out and put that in the growing a new business category, yes, that would drag the core down the way you do it. But if you look at the digital investments we've made along with the other investments we've made, in the fourth quarter, I talked about the new warehouses that we opened up to support our digital business. That -- if you look at that all in the core, yes, the core declined. I won't go into a specific number, but it really is how you slice and dice all of this. All of that said, and I wouldn't necessarily discourage you from looking at the different pieces of the business because we do have to do a better job of helping you all understand and explain where the alternative profit streams are going to come from because some of them won't affect the top line. Some of them will just be profit. But when you're trying to transform a company and you have a first year of a plan, we take all the pieces and all the available flows and profitability together and then decide how to invest them in which business, which is what we did in 2018. Kroger disappointed, what's the source? Amenity's cloud-based natural language processing (NLP) solutions help businesses draw actionable insights from text on a massive scale. 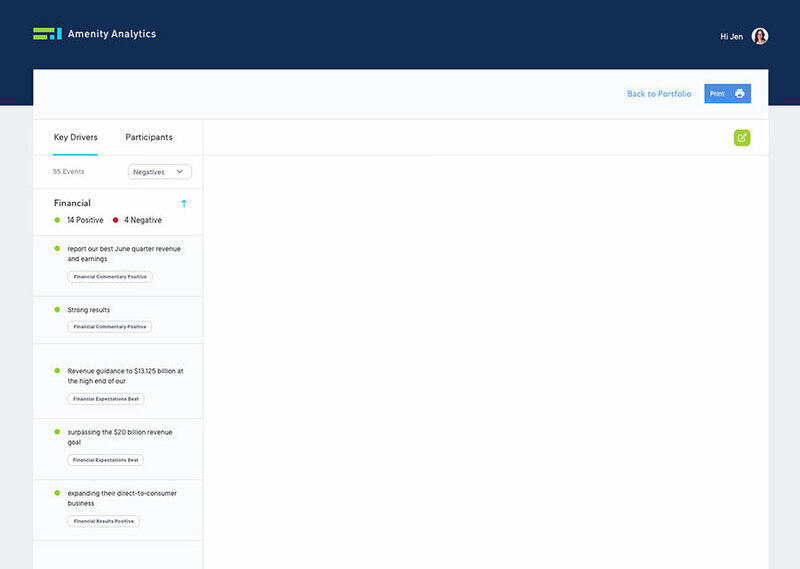 Establish causality of market-moving events via text analytics, track sentiment on political and economic issues, prioritize documents for review, plus more. Enhance underwriting and claims by identifying the key trends from regulatory documents, news and other sources. View thousands of financial reports and communications automatically at scale. Draw actionable insights from any source of text. Systematize those insights to identify new business opportunities and solve complex problems. 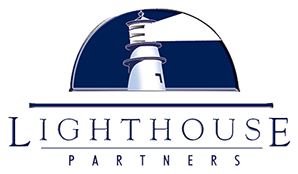 We work with some of the largest hedge funds in the world. While they don’t permit us to use their logos, they are happy to speak with you about working with Amenity Analytics. Amenity has established a new paradigm in NLP analytics as one of the leading text analytics companies. Amenity delivers real-time insights from text with unrivaled accuracy and speed. We achieve industry-leading precision by looking beyond individual words to understand the broader narrative context. Unlike other NLP solutions, Amenity's text mining software has been developed and trained specifically to solve business problems. Users can set custom parameters and tailor its functionality to support any industry. Our customized NLP tools identify and extract key information from unstructured data sources which can range from news clips, social media and research reports to regulatory filings and earnings call transcripts. 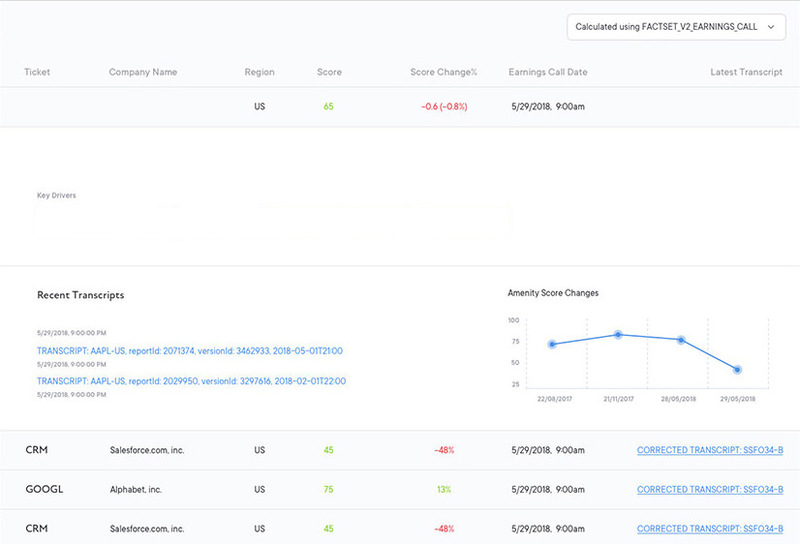 Amenity Viewer is the first cloud-based AI/NLP software designed to help financial analysts rapidly and comprehensively process earnings call transcripts, public filings, and financial data. 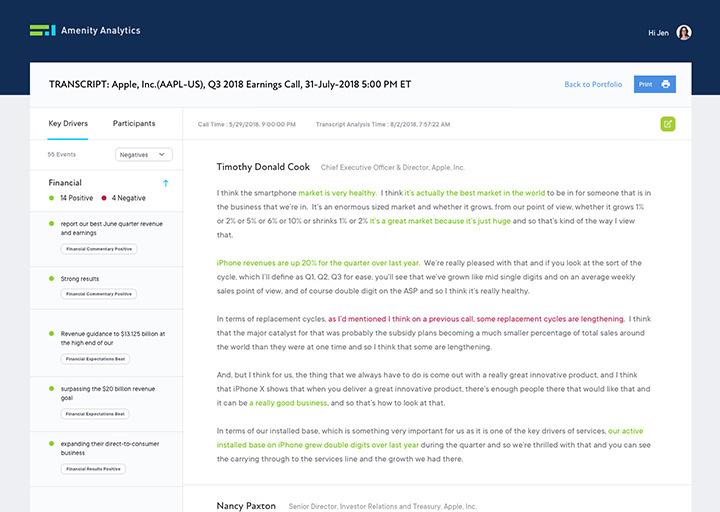 Viewer fundamentally transforms the way enterprises consume text by offering intuitive ways to navigate insights from a collection of documents. Unlike other text analytics solutions, Viewer is simple to onboard, easy to customize, and purpose-built to seamlessly enhance the work of financial analysts of all backgrounds. 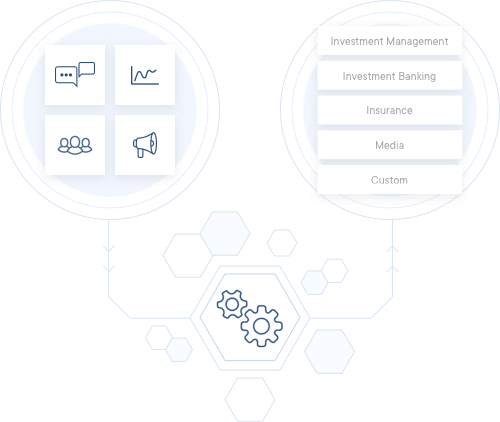 Amenity provides its AI/NLP technology as a cloud-based text analytics API allowing users to create custom insights from any text data source and to translate these insights into structured data sets. Organizations across all industries use Amenity’s API to research their competition, conduct market analysis, and inform strategic decisions such as M&A, market expansion and new product development. Amenity offers the most precise and accurate text mining software on the market. Extractions are mapped to suitable categories based on surrounding qualifiers. The sentiment and relevance of an insight are based on the context around it. An extraction can be positive for one entity and negative for another (e.g. competitor). Full grammatical parse classifies questions, hypotheticals and opinions differently than statements. Amenity Analytics CEO Nathaniel Storch presented alongside Moody's, sharing their success story in a session titled "Integrating AI Into the Data Toolkit." 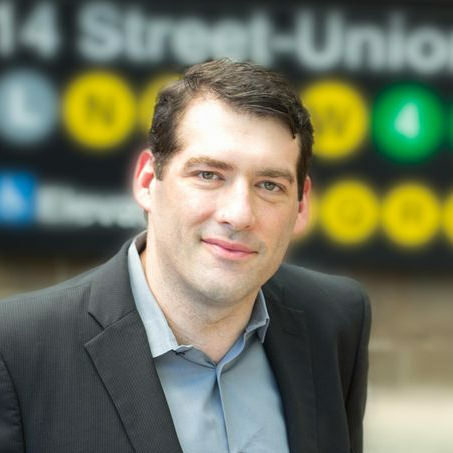 Amenity Analytics CEO Nathaniel Storch presented at Eagle Alpha's "Alternative Data: Access and Alpha" conference. Sponsored by Amenity Analytics and featured CEO Nate Storch as the keynote speaker, presenting how hedge fund managers can leverage AI to boost performance and accelrate success. Start your free trial of Viewer this earnings season. 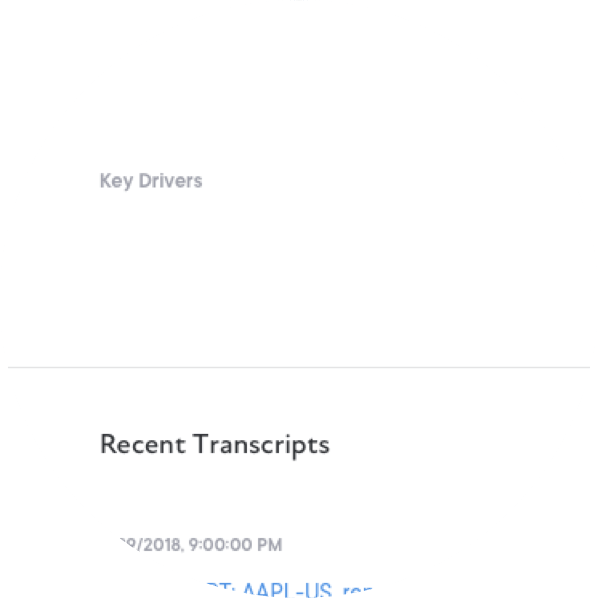 Viewer is the only AI/NLP tool with real-time transcript navigation, sentiment analysis and text mining capabilities designed specifically to extract important financial information from earnings call transcripts. See how you can apply text analytics to your workflow by starting a free trial today.